WWP sponsor Liquid Discount is having an inventory reduction sale and offering 10% off $199+ orders with code "wwplaborday10". I poked around their site to cherry pick a few key value wines. All prices are before discount. If you've never tried Barbaresco before but would like to get a feel for exactly what it's supposed to taste like look no further. If you've had this before you'll know you always want to keep some on hand. Fall is coming and Barbaresco goes great with mushroom dishes on a cool autumn evening. 2012 was supposed to be California's year but it's Oregon who is shining. Great QPR here. A friend with a really sharp palate and deep experience in the region always touts this one as a reliably outstanding reference wine. 90 points from Spectator for less than $20 is hard to come by. I'm always up for trying! I've never tried this but I've seen a ton of offers for it lately. Another great value from Spain? Code expires Monday, September 1st 2014 at 11:59 pm Eastern. Orders will ship immediately after Labor Day. Head on over to LiquidDiscount.com to shop their selection. Ground shipping is fast and very reasonable (especially on the east coast). 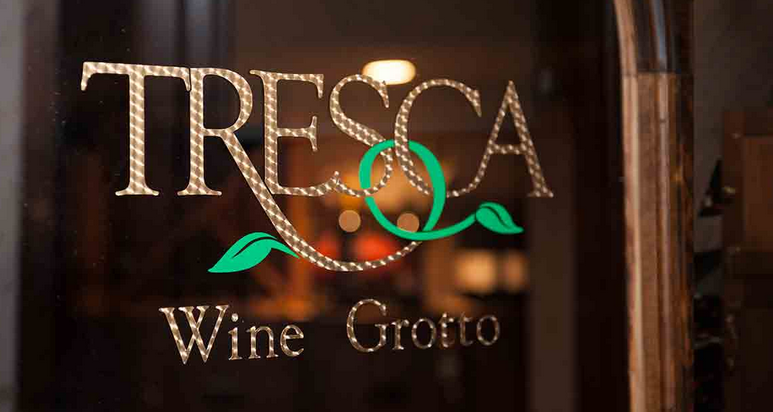 Kobrand is offering a winemaker dinner featuring Tenuta Sette Ponti and Agricola Punica at Tresca in Boston's North End. This event provides an opportunity to taste a few wines from each producer's portfolio, including the famous Sette Ponti Oreno. I keep seeing email offers for this "E" wine and seeing it on retailer shelves so I decided to buy a bottle of it. I vaguely knew that it was part of Orin Swift (the Prisoner being probably their most famous wine) winemaker's foray into international wines. Reading a bit more about it, it sounds like these are old world grapes made in a new world style. This particular bottling, E-2 (the E is for Esapana, and this is their second non-vintage bottling from Spain), is comprised of red grapes from some of Spain's most desirable regions: Priorat, Jumilla, Toro, Rioja, and Ribera del Duero. For me, Spain is the next best place to look if you've gotten into wine through California and you're looking to branch out. The wines have a similar flavor profile and are more wallet-friendly. You can't just throw darts but it doesn't take much sleuthing to find tremendous value wines from Spain. So this wine sounds right in my wheelhouse. And tasting it - it is. Rich, juicy fruit - it presents itself with more "sweetness" (a term I hesitate to use as it implies residual sugar, but I don't know how else to say it) than Alto Moncayo Veraton for example. Where Alto Moncayo (Veraton and proper) differentiate themselves compared to this E bottling is that Alto Moncayo brings more savory notes, which I find tremendously appealing when combined with rich fruit and vibrant acidity. I'd rate the E-2 in the 88-89 point range. If you judge wines on how they taste and the degree of pleasure they offer, they are all incredible efforts. The three new cuvees I tasted are among the finest wine values one could hope to find. Moreover, there are 50,000 cases of each, no easy feat given the grapes Phinney has accessed and the quality he has turned out. As of now, Dave Phinney might be my “value winemaker of the year” candidate. P.S. It’s too expensive for this report, but I am including it as an hommage to what Dave Phinney has achieved. If there are better wines for under $20 a bottle in the world today, please share that information with The Wine Advocate. You can buy this at Wine.com using code AMEX30 to get $30 off $100. Use it to round out a purchase at just over $100. At $17.99 in Massachusetts with 30% off, free shipping and no tax that would bring the price down to ~$12.59 a bottle. More info on how to maximize the Wine.com deal here. Question of the Day: Have you had any of these Locations wines from Dave Phinney? If so, what did you think? Wine Spectator recently dropped a 94-point rating on the 2012 Elk Cove Mount Richmond Pinot Noir. At least in Massachusetts, Wine.com has it for $52.99/btl (their inventory varies by state). Combined with promo code AMEX30 (which gives you $30 off a $100 order) and a free trial of their StewardShip program if you order 2 bottles of this wine in Massachusetts your fully loaded costs will $37.99/btl. With a release price of $60 this is a very good deal. Although 2012 California Pinot Noir was a bit disappointing, 2012 Oregon Pinot Noir might actually be a bright spot for the vintage. If you're interested in getting a little more cashback (~5%) on the deal go through a portal as outlined in this post. Subscribe to the WWP and never miss a deal. Mobile-focused wine retailer Drync is offering an opportunity to refer friends for $20 off their first order. As a referrer you get $10 added to your Drync account. If you're not familiar with Drync here's a review. Another great deal that's going on through the middle of September is Wine.com's $30 off $100 deal that, with the right tricks, can be used to get up to 35%+ of your order. More on that here. One of my favorite things to do while on vacation is check out local shops to see what they have to offer in the way of beer & wine. Long-time readers might recall that South Haven, MI is a place we return to almost every summer and this year was no exception. Here's a blog post from my 9 year old describing why this is such a great place: Go to Michigan! The best shop in town for wine is The Depot. Every time I go in there I'm amazed at the quality and assortment they offer in such a tiny shop in such a small town. The prices aren't bad either. I like to pick up a few summer beers here too but it's always nice to have some red wine on hand for relaxing evening consumption. The wine that jumped out at me this year was a bottle of 2011 Envolve Winery Lennox Vineyard Pinot Noir. You might recognize the Envolve name from Bachelor Ben Flajnik's involvement. Ben always struck me as a likable regular guy on the show so I made a mental note to pick up a bottle of his wine if I ever saw it around. Curious what Ben is up to these days? This article provides a nice little summary. Especially after visiting Sonoma last week (Kosta Browne, CIRQ, Radio-Coteau) I was going through California Pinot Noir withdrawal so this bottle hit the spot. Envolve Winery is a collaboration between childhood friends Ben Flajnik, Danny Fay and Mike Benzinger (yes the Benzinger wine family). Just so there's no confusion: This isn't a winery that Bachelor Ben started to leverage his fame. Winemaking was his thing when he showed up for the show. Leveraging his fame from The Bachelor to increase the visibility of his wines must be a tricky proposition. Wine Spectator has done a few articles about Flajnik over the yeras. They've rated the Envolve wines mostly in the 86-89 point range. However, I was surprised to find not a single tasting note for their 2011 Lennox Pinot on CellarTracker. That's unusual even for a low production wine. Appealing black cherry, cola, and dried herbs on the nose. The mouthfeel oscillates between round viscosity and ultra-fine tannins. Long, powerful finish. Very nice stuff. Question of the Day: Have you tasted the Envolve wines? Visited them? If so, what did you think? After finishing up our visit of Kosta Browne's new facility at The Barlow (full report) in Sebastapol we said goodbye to Tony Lombardi from Kosta Browne and hello to Kenneth Rochford and Damon Wong from CIRQ Estate. Along with Michael Browne they are the extent of the company behind CIRQ: A tiny new ultra-premium California Pinot Noir producer. When CIRQ debuted a couple years ago it was exciting news. For the first time Kosta Browne's winemaker (Michael Browne) would have total control over the vineyards. 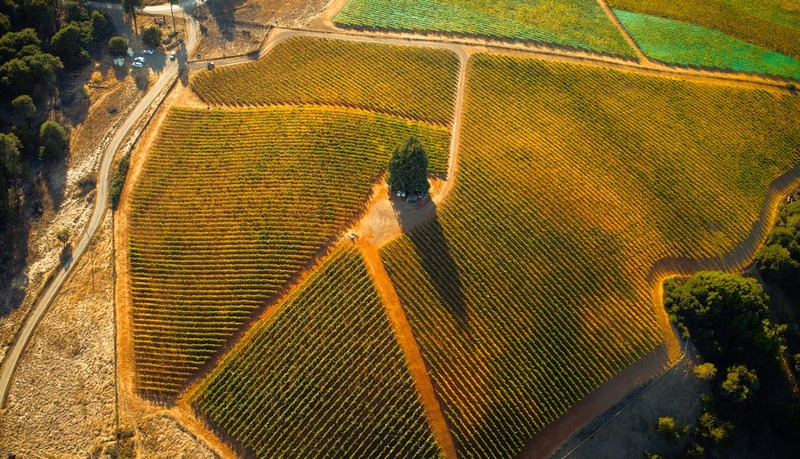 Kosta Browne just recently acquired a parcel of land from one of the vineyards they source (20 acres of Keefer Ranch) so they can technically call a future bottling "estate". But CIRQ offers an opportunity to define the next generation of elite California Pinot Noir from the ground up. Working with renowed Pinot Noir grower Charlie Chenoweth, CIRQ developed two vineyards: Treehouse and Bootlegger's. We visited Treehouse - an amazing hilltop property in west Sonoma County with red, iron-rich Franciscan soil surrounded idyllically by coastal cypress trees. In 2008 Treehouse was developed on land previously used for cattle. 13.5 acres of Pinot Noir are planted here. CIRQ was established in 2009. 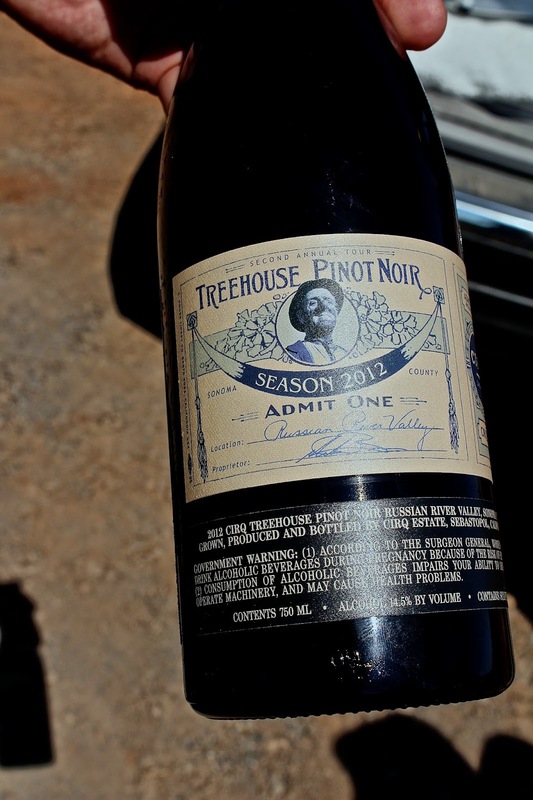 Their first production vintage was 2011 when 500 cases of Treehouse were produced. Treehouse is hard to figure out. The vineyard is located eight miles from the Pacific Ocean and yet, 100 yards away, lies a stand of coastal cypress. Nobody can explain it. Why those trees thrive in that place, when every other tree is either a redwood or a fir, is a mystery. Or perhaps, an omen. Treehouse is remote and expensive to farm. Irrigation water for the young Pinot Noir vines needs to be trucked in. It's named for a large tree that sits atop the property where they actually plan to build a treehouse. It was early August when we visited. Harvest would be underway a few weeks later. For as much California Pinot Noir as I enjoy this was the first time I can recall seeing Pinot Noir grapes hanging on the vine nearly ready to harvest. Although they look plump in the photo above I was actually surprised how tiny the grapes were. The low skin to fruit ratio produces concentrated wines. We visited a week ago today and the shoes I was wearing still have red dust on them as if I'd been tromping around Mars. I was curious how separate CIRQ's operations are from Kosta Browne's. Although CIRQ produces their wine at Kosta Browne's facility as a client winery they are surprisingly well separated. The mailing list, marketing, vineyard operations, and fulfillment are completely separate. The only common element is Michael Browne. As we were finishing up our time at Treehouse we got a chance to taste the 2012 Treehouse that's going to be released this fall. Since they don't have a tasting room we tried it right there in the vineyard. A natural question that's been on my mind since I first heard of CIRQ was: What would it taste like? Would it go in a richer, riper direction than KB's already-rich style? Or would it veer in a completely different direction? The answer, for me, based on this one tasting is that CIRQ is every bit as intense as Kosta Browne from a flavor perspective. But high acidity and a touch of tannic grip at release make CIRQ an ideal wine for enjoying with meals for special occasions. The 2012 Treehouse is aged in 50% new French oak for 16 months with no racking. It is a bright and brilliant dark magenta visually. Aromatically it leans towards dark black fruits. It is brambly with prominent acidity and a bit of tannic grip. The intensity of flavor is striking with a pleasing mouthfeel. It presents itself as a brighter wine than most Kosta Browne Pinots. I decided to hold the wine back for a full year after bottling to give it more time for the tannins to integrate and for more complex aromas to develop. This is something I’ve always wanted to do. Our wines definitely benefit from added bottle aging. They emerge relaxed, composed. In an ideal world, our wine would rest for 3-5 years after release. I know this won’t happen for a good portion of the bottles, wine drinkers being who they are. But with at least a year of bottle age before they’re opened, the wine will present itself the way I intended. I have a feeling they know their clientele. I bet most of the 2011s shipped this spring will be consumed by the end of the year. Hopefully a bottle or two will survive to start getting a feeling for how these wines age. Wines from Bootlegger's, which we didn't taste, are said to be more elegant, plush and red-fruited. The soil at Bootlegger's is a khaki-colored Goldridge. Treehouse and Bootlegger's are the two vineyards in the CIRQ portfolio. Is CIRQ worth $100 a bottle? If we look at Kosta Browne's 2012 pricing we see appellation wines at $64/btl and single vineyards at $84/btl. If/when KB releases an estate Pinot Noir it'll probably go for $100/btl. So while CIRQ's pricing at $100/btl sounds audacious at first it wouldn't make sense to price it south of the Kosta Browne wines. Although there are other California Pinot Noir producers up at this price point (Marcassin and Peter Michael come to mind, along with single vineyard bottlings from Paul Hobbs, Foxen, Williams Selyem, and Sea Smoke) I think some were taken aback that CIRQ would debut at an even, confident $100. It was an absolute pleasure to visit CIRQ and taste this exciting new wine in such an amazing setting. I would love to have a couple bottles of CIRQ in my collection waiting for a special occasion, but the $100 price point is indeed tough for me to get my frugal mind around. That said, if anyone can convince me to break out the credit card and splurge it's Michael Browne. I'll be watching future releases with interest. If you haven't already you absolutely have to check out CIRQ.com where you'll find amazing videos describing what makes CIRQ and their estate vineyard special. Highly recommended. While you're there hop on their mailing list for future allocations. Question of the Day: Are you on the CIRQ mailing list? Have you tried it? Are you on the KB mailing list but couldn't bring yourself to pull the trigger on the $100 CIRQ? I'd love to hear your perspectives on this new project. When I visited Kosta Browne a couple years ago they were in the process of building a new winery. Their space at the time was in an old apple processing facility and it was functional but not much to look at. "No stone gardens here!" was one of their favorite lines. The no-frills approach worked fine in their formative years. They didn't have a need for a public tasting room since most of their wines are sold out via mailing list and to restaurants. But as the winery has grown they needed more space. Functionally and aesthetically I think they hit a home run with their new spot in The Barlow - a very cool collection of artisinal food and drink producers in Sebastapol along Highway 12. We enjoyed lunch at newly opened Vignette - a trendy Neapolitan-style pizza place. Michael Browne happened to be having lunch there too, as were many other Barlow tenants and visitors. Other wineries include MacPhail, and La Follette (just tasting rooms) as well as Wind Gap (which along with Kosta Browne produces wine on-site). We met with Tony Lombardi, Director of Brand Management & Public Relations. He's really come into his own in this role and fits the Kosta Browne style perfectly. Easy going about the product, confident about the quality, and enthusiastic about sharing the story with fans of the brand. They've got a very cool outdoor space with seating areas and fire pits that's already serving them well for gatherings. Benefits and events for mailing list members will be ideal here. 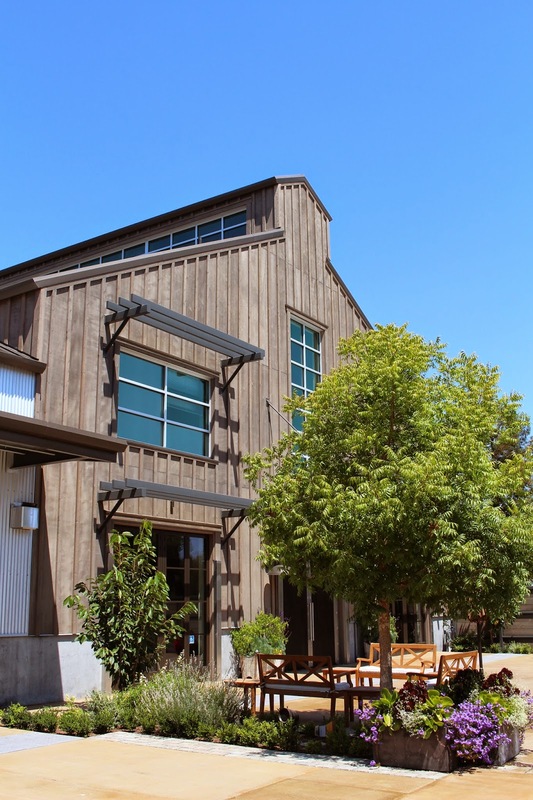 Their space at The Barlow includes winemaking facilities with room to grow. Separate areas for cellaring and offices are in adjoining buildings. With a number of successful harvests behind them they knew exactly what they wanted in the new facility. I got a sense they took note of every thing they didn't like about their prior place, remedied it, and made this the perfect winemaking facility for their current and future needs. The interior looks like a Restoration Hardware catalog and the space is divided up brilliantly. Clubby leather chairs for gathering around a fireplace in one alcove, long tables for sit down tastings in another. Although there's not necessarily a "tasting room" in the typical sense there are plenty of ideal areas in the winery to taste wine. We tasted through their 2012s in their kitchen which features a wall of glass looking into the cellar and is set up for cooking events and informal tastings. Spacious and elegant but comfortable. It's like tasting wine at your rich friends' house. Kosta Browne feels like a group of guys who enjoy the good life and enjoy sharing it with their friends. Their 2012s are gorgeous, like most vintages of Kosta Browne I've tasted. Each time I think "I've got too much KB clogging up my cellar waiting for a special occasion" I'm reminded why I like their wines so much. I popped a 2010 RRV the other night and it was so totally satisfying. They're right on the corner of high quality and delicious. One wine that's truly amazed me each time I've tasted it is their Chardonnay. They've only been making it a few years and they don't make a ton of it but the nose on this wine is magical. Lemon curd and sunshine for days before getting serious on the palate. They've got the Chard on sale at Zachy's at the moment at a nice price considering how hard it is to crack their mailing list and how much fully loaded costs can be. I'd hardly ever consider paying $50 for a California Chardonnay but I'm thinking of getting a couple bottles. The Pinots were terrific. The Russian River Valley is always a favorite and this vintage didn't disappoint. My first time trying the Santa Lucia Highlands (I've never been allocated any) and it was nice too. But the Sonoma Coast was probably my favorite of the appellation bottlings. Just absolutely classic California Pinot Noir. For single vineyard Pinots, we tried the Keefer and Kanzler. Both were a bit darker in style overall than the appellation wines but the single vineyards were satisfyingly serious with a ton of complexity and undenyable site-specific markings. They were both great but the Keefer was probably a bit more to my liking that day. I'd love to go back and spend more time focusing on the wines but it's always such a fun relaxing time at KB I try to just take it all in. Kosta Browne's new facility at The Barlow is an amazing place. They're not open to the public but if you're on their mailing list it's absolutely worth dropping them a line to ask for a visit - even if you've recently visited them at their old location. You can join their mailing list here. It took me 2 or 3 years to get an allocation but that was a few years ago. That was before they won Wine Spectator Wine of the Year (for their 2009 Sonoma Coast Pinot Noir) but production levels have increased gradually over time so there's hope! This visit reminded me I should keep buying their wines in moderation and giving myself permission to open them without needing a special occasion. They're pricey but I think relative to the quality they're a value. With shipping to MA hopefully opening next year fully loaded costs and ease of shipment should improve the equation further. At the end of our visit the guys from Michael Browne's new project CIRQ stopped by to take us on a vineyard tour. Can't wait to tell you about it. I'd love it if you subscribed to the WWP for future updates. Question of the Day: What's been your experience with Kosta Browne wines lately? On their list? Still waiting for an allocation? How long does the wait list take to crack these days? After challenging California Pinot Noir vintages in 2010 and 2011, there was hope that 2012 would be one of those vintages where every wine you taste exceeds expectations. But in my experience with 2012s over the past year I've been disappointed. There have been very few new exciting new discoveries and wines I've tried from favorite producers seem a notch below where they usually are. Wine Spectator's latest issue covers the vintage (subscription required) and their take is that it was a vintage with high yields that led to many thin, tannic wines and uneven quality. Perfect weather. Imperfect results. How can that be? Well, unless vineyard managers dropped fruit at the right times during the growing season clusters were too large, the grapes themselves were too large, and the grapes that remained on the vine were competing for scarce nutrients and the result was plump grapes that lacked concentration. In talking with winemakers about green harvesting I'm told it's a dicey proposition. You don't want to do it too soon because you don't know how the last months of the growing season are going to shake out. And you don't want to do it too late because once verasion has completed it's ineffective. Further, there's resistance to it throughout the production chain even with per-acre contracts in place. Nobody wants to take potentially viable fruit and toss it on the ground. But the best producers do and along with thousands of other decisions are able to deliver a product that meets or exceeds expectations. For me the key thing the 2012s have lacked that the amazing 2009 vintage had was luscious vibrance. Too many of the 2012s just seem to be asleep whereas the 2009s jumped out of the glass and invited another sip. Time will tell whether the 2012s just need time to develop. For now, I'm going to let the remaining 2012s I have rest while exploring prior vintages. So 2010 had a massive heat spike right after many winemakers pruned leaves to help grapes ripen. 2011 had rains (in California!) during harvest season. And 2012 was perfect. But imperfect. You've gotta love it when things don't work out the way you thought they would. It reminds me my stock picking acumen. Even after reading an earnings report I swear I guess wrong 90% of the time on the way the market is going to react to the news. With 2012 I thought it was time to go all in. Turns out we need to every bit as selective - if not more- than in 2010 and 2011. 2013 looks to be a bumper crop as well, and not necessarily in a good way. Beware of early hype and keep an eye on yields. It looks like it's going to be another vintage where selective purchases from trusted producers while seeking out a few new producers is the way to go for building a balanced cellar. I'll be following up with a report of the 2012 California Pinot Noirs I've tasted along with a trip report to some amazing Sonoma Pinot Noir producers. I recently visited Kosta Browne at their new location in The Barlow, CIRQ Estate, and Radio-Coteau. I'd love it if you subscribed to the WWP for updates. I wrote a post a couple weeks ago about how to maximize the savings associated with Wine.com's $30 off $100 AmEx Sync deal. But it wasn't until this follow-up post that showed tangible examples of the savings that I got a bunch of emails from eagle-eyed deal hounds asking for clarification on whether it was 30% off or $30 off. But the deals can be amazingly compelling if you optimize this opportunity. For example, 2012 Caymus for an effective price of $38.99 if you buy it along with a $40 wine like the 2012 MacPhail Sonoma Coast Pinot Noir ($42.99 is effectively dropped down to around $27.84 with discounts) to get an order at just over $100 and take advantage of all the savings opportunities. Again, it takes some sleuthing but I think it's worth it. By the way, those links are affiliate links so if you use them I get a commission. You'd be better off shopping through a portal for an additional 5%+ savings (be your own affiliate!) but if you don't want to hassle with portals it would be great if you used these links. One aspect of the deal that's important is that you avoid being automatically subscribed to their $49/year StewardShip program. It's a fine program but deal hounds know to avoid subscriptions of all kinds if they can avoid it. So be sure to cancel your StewardShip free trial before 30 days are up. 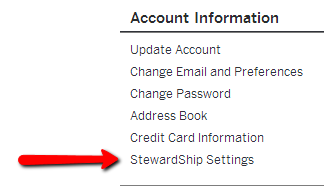 Step 2: On the left hand side of the page, click "StewardShip Settings"
Step 3: Click "Do Not Renew"
The default setting is for StewardShip to auto-renew. But if you opted *not* to save your credit card on file when you placed your order they, kindly, won't be able to charge it to renew StewardShip. But to remove all uncertainty click "Do Not Renew" (even though it's greyed out). You can do this as soon as you'd like after placing your first order with them. If you signed up for multiple Wine.com accounts, be sure to do this for each of them. Let me know if you have any questions: wellesleywinepress@gmail.com or @RobertDwyer on Twitter. I was in and around Boston a ton yesterday and was reminded once again what a great city we live near. When the Red Sox are playing at home it sets the tempo for the entire city and it's a joy to be a part of. They were playing the Yankees yesterday which always takes things to the next level - even though the Red Sox have thrown in the towel on the season by trading away their pitching staff. I wanted to meet up with a friend to exchange wines we'd purchased with each other over the past few months and The Capital Grille's Boylston Street location provided an appealing central location. This is one of my favorite restaurants in the country. What started off as "drinks and appetizers" evolved into quite a feast thanks in part to their awesome service and The Generous Pour event which runs through August 31st. 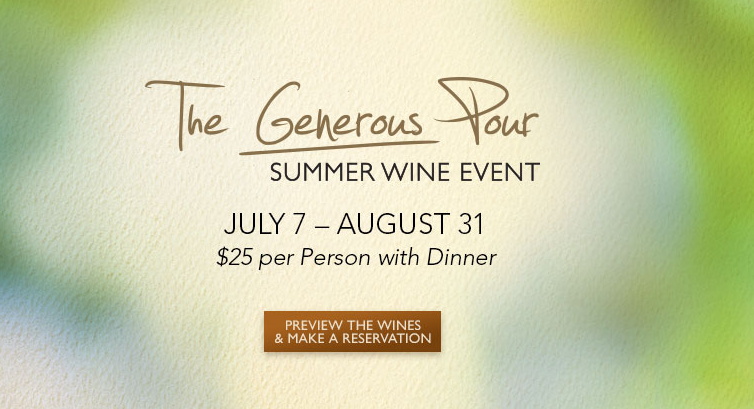 For $25 with dinner you can enjoy 7 different wines, this year from California and Oregon. Pro Tip: Valet parking is just $16 even on game day and you can easily walk to Fenway from the restauarant. We started off a with a bottle of 2012 Juan Gil Monastrell, which was easy to discover with their new iPad-based wine list. No more massive wine list to scan. I just tapped "Region" then "Spain"and voila - there was the Juan Gil. It was my first time tasting the 2012 and it seemed a little less fruit forward than prior vintages for better or worse. I'll have to buy some for closer analysis on my home court but for $40-some dollars on their list (and available south of $15 at retail) I think it's a great buy. See also: Value Wine Discovered...at a Steakhouse! We started off with some Chilled Seared Sushi Grade Tuna and Lollipop Lamb Chops paired with a taste of the 2011 Arrowood "Catchwire" Sonoma Bordeaux Blend. I don't know if it was the power of suggestion of the word on the label or what but it definitely was reminiscent of Bordeaux - a bit green and quite tannic but otherwise a pleasant red wine. 73% Cabernet Sauvignon, 25% Merlot, and 2% Petit Verdot. From there we switched things up a bit with a taste of Alaskan King Crab Legs paired with the 2012 Atalon Napa Valley Sauvignon Blanc. What a terrific pairing! The interplay of the crab legs and drawn butter with the crisp Atalon with soft edges was tremendous. The wine is fermented in stainless steel tanks but sees a bit of time in neutral oak barrels to give it kiss of sunshine. Really well done. I've been enjoying quite a bit of California Sauvignon Blanc this summer and this wine is an example of why I like it. Next was a taste of New York Strip Steak, simply prepared medium rare with a trio of sauces on the side: Bernaise, Au Poivre, and the Shallot Butter their famous Kona preparation is paired with. Terrific stuff obviously. And don't forget the sides: Lobster Mac & Cheese (always a table-favorite), Au Gratin Potatoes, Creamed Corn with Smoked Bacon, and Truffle Fries. It's amazing how well they do sides. Everything really. This was paired with the 2012 La Crema Willamette Valley Pinot Noir. La Crema has been making terrific California Pinot Noir for years. This is their first forray into Oregon and it comes together nicely. It tastes pretty much exactly like what I'd think a La Crema Pinot produced in Oregon would taste like: Appealing soft red fruit aromatics, tea, a hint of Oregon twang in the background. It carried itself just fine with the steak. Nice wine. Finally for dessert we had their amazing Coconut Cream Pie and Flourless Espresso cake. This was paired with a 2007 Kendall Jackson Late Harvest Chardonnay. This year's Generous Pour lineup includes a few other wines we didn't taste: a Byron Charonnay, a Freemark Abbey Merlot, and a Caramel Road Riesling. The Capital Grille's Generous Pour event continues to be one of the best steakhouse wine experiences you'll find. This year's wines are more domestic than ever before, but there are some curve balls: Riesling from Caramel Road rather than Pinot Noir. La Crema from Oregon rather than California for example. Especially when your server customizes the service of the wine to go with the food you're tasting it can be a really special experience. Definitely check out their Boylston Street location in Boston if you're ever in the area. Especially if you can catch it before, during, or after a Red Sox game. It's a fantastic way to get a feel for the great city of Boston. Go here for more information about their Generous Pour Event.